The University of Pittsburgh and Pittsburgh Filmmakers will present the 16th Annual Russian Film Symposium from Monday 5 May to Saturday 10 May 2014, at Pitt’s Oakland campus and Pittsburgh Filmmakers’ Melwood Screening Room at 477 Melwood Avenue. 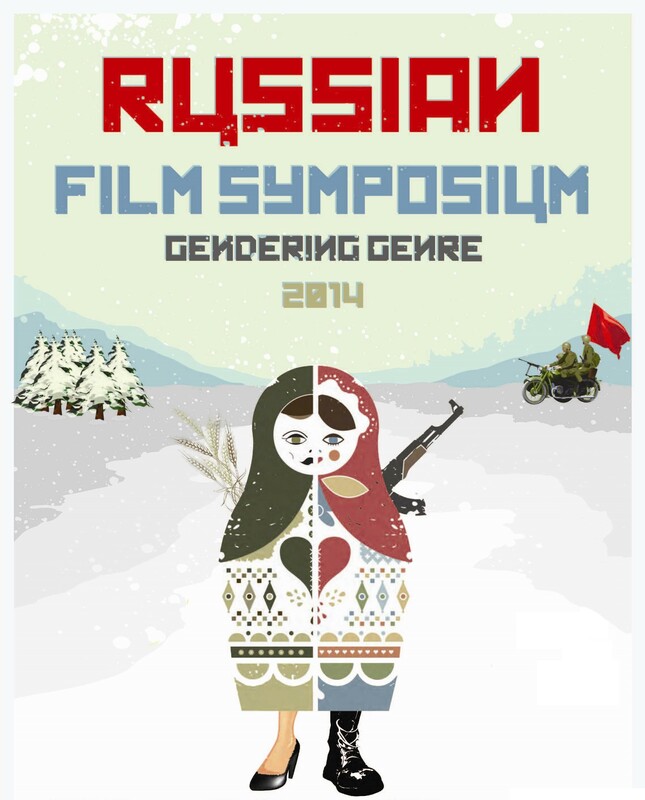 Under the title Gendering Genre, the Russian Film Symposium offers a unique chance for the public to view recent films and examine how gender and genre stereotypes are foregrounded and subverted in recent Russian cinema. If five to seven years ago a typical Russian multiplex would screen more foreign films (European, Asian, and American) than domestically produced ones, by 2012 virtually the only national cinemas present on screens were Russian and American, with attendance frequently higher for Russian .films. For the past four years the top three box-office hits in Russia have been domestically produced films. Ironically, during this same period the Russian film industry has (seemingly?) abandoned its earlier experimentation with a variety of genres (gangster films, buddy films, road movies, historical epics, comedies, melodramas, etc.). Instead, screens in Russia are now dominated almost exclusively by two genres: romantic comedies (usually set in Moscow or Saint Petersburg) and gritty dramas about everyday life (usually set in the provinces). This “center” versus “periphery” binary of the two genres is paralleled by the gender binary of target audiences: the romcoms are clearly marked as being “woman friendly,” while the gritty dramas deliberately flex their masculine muscles. As much as issues of intimacy and emotional states lie at the center of Russian romantic comedies, alienation and explosive physical violence are at the core of the gritty dramas. The symposium brings well-recognized scholars and critics working in Russian film from Russia, the UK, and the US, including Viktoriia Belopol’skaia, programming director of ArtDocFest festival and regular contributor to film journals Séance and Iskusstvo kino; Anzhelika Artiukh, film scholar and film critic, whose reviews were published in Iskusstvo kino, Séance, Film Comment, and Imago; Philip Cavendish, the author of The Men with a Movie Camera: The Poetics of Visual Style in Soviet Avant-Garde Cinema of the Silent Era (Oxford, UK: Berghahn, 2013); and Jeremy Hicks, a specialist in Russian documentary cinema and the author of Soviet Cinema and the Genocide of the Jews, 1938–1946 (Pittsburgh: University of Pittsburgh Press, 2012). From Monday, May 5 to Friday, May 9, the morning (10:00 a.m.) screenings in Room 1500 Wesley Posvar Hall will include five films: Boris Khlebnikov’s Altmanesque comedy Till Night Do Us Part (2012); the apocalyptic parable and the last film of the recently deceased Russian auteur Aleksei Balabanov Me Too! (2012); Kira Muratova’s bizarre melodrama Eternal Homecoming (2012); Larissa Sadilova’s social drama She (2013); and Sergei Tarmaev and Liubov’ L’vova’s Winter’s Journey (2013). The three afternoon (2:00 p.m.) screenings in Room 1500 Wesley Posvar Hall on May 5, 6, and 9, respectively, will include: a gay-friendly family melodrama Dumpling Brothers (2013) by Gennadii Ostrovsky; Ivan Vyrypaev’s Delhi Dance (2012); and the mock-ethnographic Celestial Wives of the Meadow Mari (2012) by Aleksei Fedorchenko. From Wednesday, May 7 to Saturday, May 10, the four evening (7:30 p.m.) screenings at Pittsburgh Filmmakers’ Melwood Screening Room include the scandalously explicit melodrama Intimate Parts (2013) by Natalia Merkulova and Aleksei Chupov, banned for theatrical distribution in Russia; Aleksei Mizgirev’s dark army tale The Convoy (2012); Ekaterina Telegina’s Hollywood-style romcom A Habit of Breaking Up (2013);, and Vasilii Sigarev’s tragic triptych Living (2011). Admission costs for the duration of the Symposium are $8 regular admission; $7 seniors and students; $4 Pitt and Art Institute students. The Russian Film Symposium is supported by the University of Pittsburgh Office of the Dean of the Kenneth P. Dietrich School of Arts and Sciences; the University Center for International Studies; the Center for Russian and East European Studies; the Humanities Center; the Department of Slavic Languages and Literatures; the Program for Cultural Studies; the Graduate Russian Kino Club; and a grant from the Hewlett Foundation. Pittsburgh Filmmakers is a co-sponsor of the Symposium. All films will have English subtitles. For more information contact Prof. Vladimir Padunov at padunov@pitt.edu.